Walsh CP, Nessler JP, Markel DC. modular neck femoral implants. Journal of Arthroplasty 30 (2015) 822-826. In this study a computer assists the surgeon for the most accurate alignment. This knee joint replacement device rotates slightly internally and externally similar to your natural knee joint. Dr. Nessler sis 456 Dual Incision procedures between March 17, 2003 and December 21, 2005. Of those patients sixty-eight had the other hip done with an alternative approach. 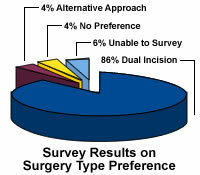 We surveyed this group of patients to see if they had a preference with the results of this survey shown in the pie graph.